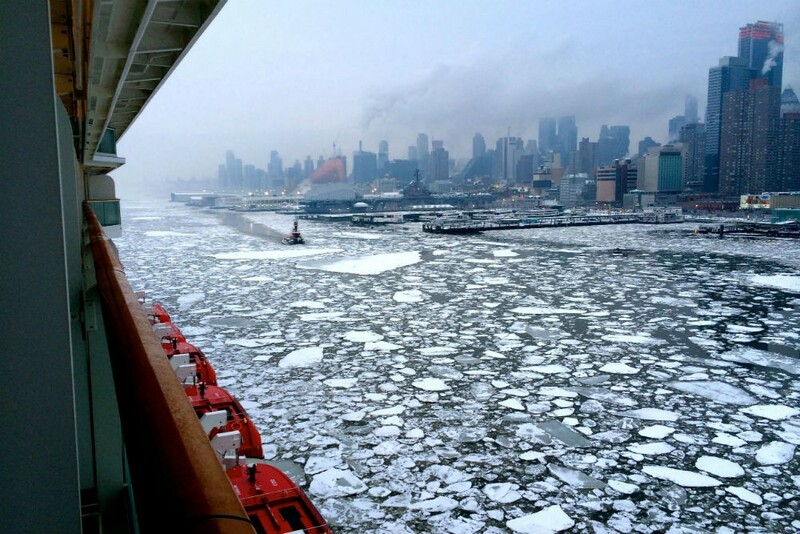 The Norwegian Breakaway cruises into the port of New York at 7:00 a.m. on February 22, 2015. One of the biggest reasons to travel by ship is the views as you come into port. Yesterday, as my family sailed into an ice-filled New York Harbor—the final stop of a winter cruise to the Bahamas—I was reminded that certain amazing sights in this world can be seen only by ship. Even though I’m a jaded New Yorker who grew up in midtown Manhattan, the scene was otherworldly. It was well worth waking up at dawn, and shivering on my balcony, to capture it. Enjoy! 4,000-passenger ship pulling into an icy Pier 88, NY Harbor, 7:30 a.m. on a Sunday in February. Home safe. What’s your favorite port in the world to sail into? I, along with my family (3 kids from 17 to 7), were on the ship with you last week. You are now considered one of my newest and closest friends of the 4000 people on the Breakaway. I agree that the NYC port was awesome, and I did wake up at 6:20am to watch us come up the Hudson. Although I did not photograph it, the Statue of Liberty and Ellis Island were awesome sights. Ah, your cabin must have been on the other side of the ship. The Statue of Liberty and Ellis Island were off our balcony as we sailed out of New York Harbor at the start of the cruise. Sorry we didn’t get to meet on the ship!